When my family wants the full Disneyland experience, and when we have the time and money to spend there, we prefer to stay at one of the three official Disneyland Resort Hotels. There is something about the theming, the perks, the location, and that only-at-Disney feeling that can’t be beat. However, sometimes it just doesn’t make sense for us to spend the extra money for a Disney hotel when all we really need is a comfortable bed, a short walk to the parks, and a shower. When that’s all we need, we are totally fine booking a Good Neighbor Hotel. 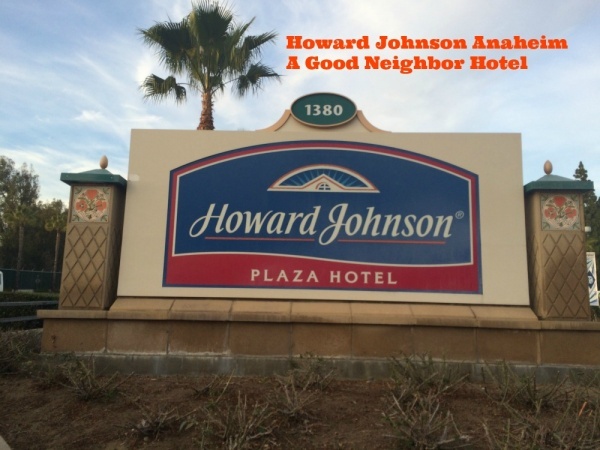 For our recent short trip to Disneyland, we opted to stay at one of our favorite Good Neighbor Hotels, the Howard Johnson Anaheim. 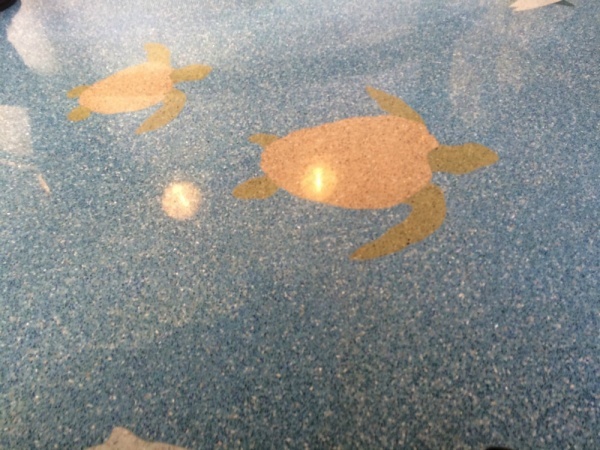 It’s located at 1380 S. Harbor Blvd. and is a short 8 minute walk to the pedestrian entrance to Disneyland. We stayed one night, a Friday, and our room charge came to $199. This was significantly less than all three of the Disneyland Resort Hotels for the same night. For one vehicle, there was no parking fee. Upon check in, we received wristbands for Castaway Cove, the pirate themed water playground. We also received two coupons: one for a free appetizer at Bubba Gump’s (not on Disney property) and the other was for a free appetizer or kids’ meal at the Rainforest Café at Downtown Disneyland. The check in staff was very friendly. When we checked in, I informed the check in clerk that my husband would be joining us later with a separate vehicle. She said that there is usually a $20 fee for an additional vehicle, but since many guests did not have cars with them this evening, she waived it. She did all this without me once expressing displeasure at being charged an extra fee. Another perk of this hotel – at some area hotels, if you’re planning on visiting the parks past check out time, you are asked to move your car to the Disneyland parking structure. This adds to your expenses and cuts down on your park time since you have to spend time moving your car. Every time we’ve stayed at the HoJo, we were told that we were welcome to leave our cars at the hotel until it was time for us to drive home. I asked specifically this time since we had two cars parked and it was no problem. As long as we left our parking permit (issued upon check in) we were more than welcome to leave our cars there. We stayed in room 1614. 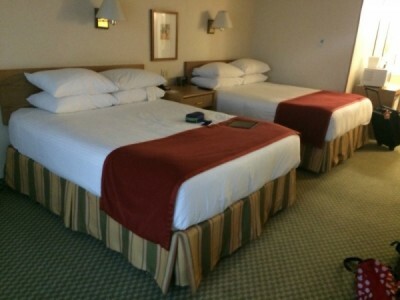 The room was spacious and the two queen sized beds comfortable. However, one of the beds was very close to the wall, while the other one had loads of room on the opposite side. It seemed like there was some wasted space here. The bathroom, equipped with shampoo, lotion, conditioner, bath soap and face soap, is small. 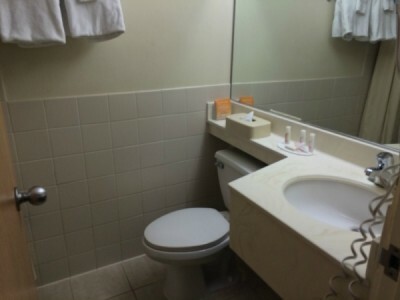 Luckily there is a separate vanity area with a sink outside of the main bathroom so we could all get ready in the morning without much of a hassle. 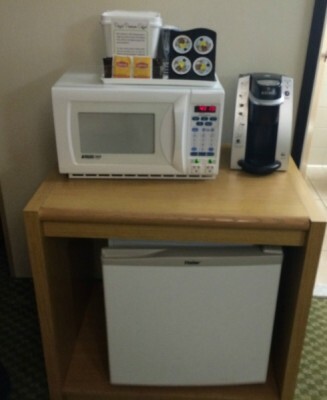 The room came with a coffee maker, coffee, tea, and condiments, a microwave, and a refrigerator. The fridge was turned off with a note inside saying guests are welcome to turn it on if they will use it. There was ample drawer space and closet space. Two sets of sliding glass doors led to a small balcony. 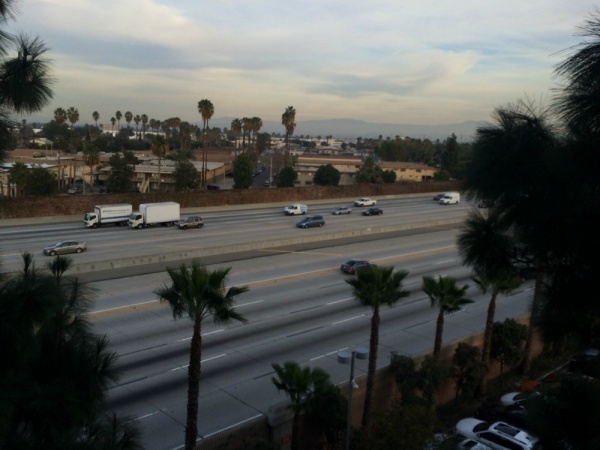 However, the balcony from this room looked out over the freeway, which wasn’t a view that was thrilling. Despite it’s proximity to both the parks and the freeway, the room was nice and quiet. At 9:00 p.m. we did hear the fireworks, but it wasn’t the “we’re under attack” sound we heard previously at this hotel. Either our room was simply farther away from the park or they’ve done an upgrade with their soundproofing. The sidewalk running from this hotel to the pedestrian entrance to Disneyland is well lit at night. Parents of young children should note, however, that it passes by the driveways of other hotels. Be vigilant that your child doesn’t wander into one without looking out for cars first. There is no restaurant on property but their shop, Main Street, sells simple breakfast items. There is also a small game room. 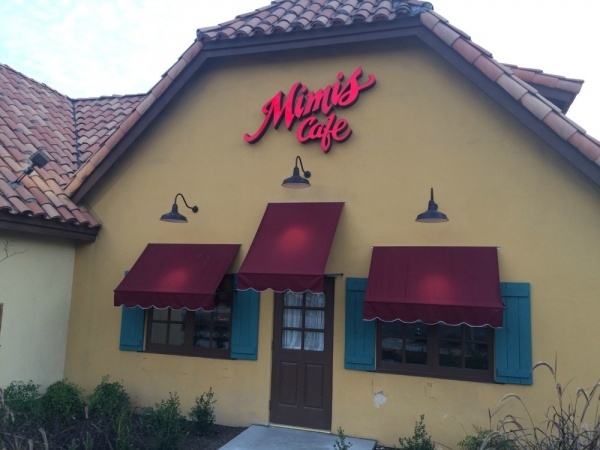 Mimi’s Café, which opens for breakfast at 7:00 a.m., is right next door. Also, on your walk to Disneyland you will pass other restaurants such as McDonald’s. The landscaping at this hotel is lovely, with tile work and lots of greenery. The hotel has no theme per se, but the décor is reminiscent of mid-century America, to coincide with the opening date of Disneyland. One of the highlights of this hotel is the water playground that is themed after a pirate ship. Although this trip was too cold and too short for us to take advantage of it, this is a real perk for folks who would like to take a break from the parks for a swim. Because of the friendly, courteous staff, the cleanliness and size of the rooms, the reasonable price, the location, and the fun pool area, I recommend the Howard Johnson Anaheim for families. I’d stay here again, no question. Have you ever stayed at the Howard Johnson Anaheim? What are your thoughts? Share with us in the comments. Curious about a Disneyland trip? Request a no-obligation quote with The Magic For Less Travel!